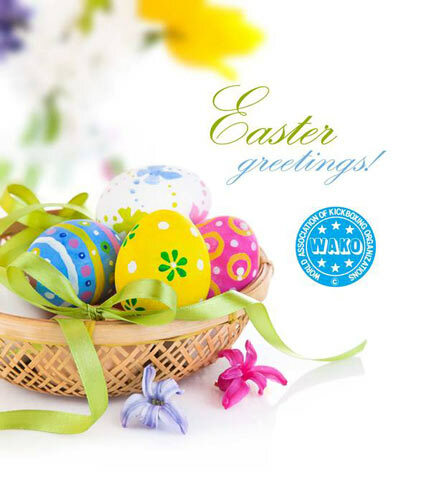 To those celebrating in the upcoming days wish you and your families a peaceful and joyful Easter time! 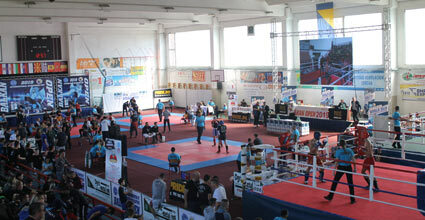 The 4th Turkish Open Kickboxing European Cup which is in the activity programme of both World Association of Kickboxing Organizations (WAKO) and Turkish Kickboxing Federation started today in Antalya with 2500 participants from 29 countries and 361 clubs. 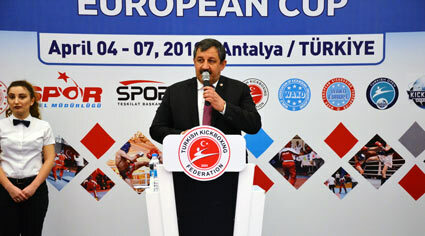 At the opening ceremony WAKO President Roy BAKER and WAKO Europe Vice President Salim KAYICI delivered their speech and mentioned the main purpose of sports is friendship and peace, for this main aim WAKO is trying its best. They both wished success to all participants and the whole audience shower their "white card" after opening speechs. It is my pleasure and great honour to invite you to take part in WAKO Children, Cadets and Juniors European Championships which will be held in Gyor, Hungary from August 24th, to September 1st, 2019. Attached you can find Official Invitation with all important information about the Championships. Official Invitation you can also find on both WAKO Europe and WAKO web pages. According to WAKO rules and regulations the eligibility for the participation is reserved only to WAKO National Federation/Association members. - Starting from this year Children (7,8,9 years old) are allowed to participate on Championships in POINT FIGHTING! - Registration will be possible only on SPORTDATA. It is mandatory to register each participant (athlete, coach, official...) with uploading photo (passport photo) on SPORTDATA! Registration withoput uploaded photo of each participant will not be accepted on SPORTDATA! - REGISTRATION on SPORTDATA after Wednesday, July 31st is not possible! - OFFICIAL PROGRAM SCHEDULE must be strictly respected! For more information about city of Gyor please, visit www.hellogyor.hu. Looking forward to see you all in Gyor! Balkan Open 2019 held in Tešanj 23-24.03.2019 /Bosnia and Herzegovina,participation number of entries 624,number of clubs 88,number of countries 15. Chief judge Neđo Bratić,Bosnia and Herzegovina. Competition held on 4 tatamis and 2 ring.Event was heald in a sport atmosphere. 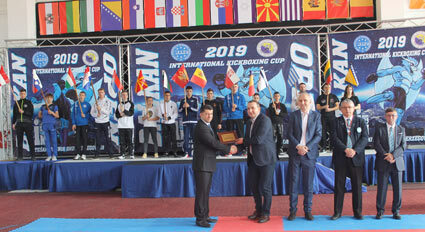 Balkan Open 2019 another great WAKO event has been successfully organised traditionaly 12 times.Top level of organisation has shown that,year after year this signification tournament has improved in every way-from sports,competing,overality and organisation to hospitality. Both female and male kickboxers has shown high quality in their performances and presented all the beauty of sport to big crowd of spectators. Mayor town of Tešanj Mr.Suad Huskić with your associates and President of the Association of Businessmen Jelah-Tesanj Mesud Ajanović, who opened the Balkan Open 2019.
and Mr.Alija Ogrić Vice President WAKO Balkan Kickboxing Union. Montenegro,Grece,Izrael,Poland,Litvania and Bosnia and Herzegovina. Best team in the ring disciplines KBV Flek Tom Cat Tuzla/Bosnia and Herzegovina and tatami discipline team CBS Tešanj/Bosnia and Herzegovina..
We thank all participants for coming. It is with deep regret and sorrow that we announce that Mr EuyWoong Mah passed away peacefully early yesterday morning at his home in Seoul (Korea). Mr Mah was a member of the board of WAKO IF from 2011 to November 2015. He was also the founder of WAKO Korea and a member of WAKO Asia Continental board. The president of WAKO Europe and WAKO IF, Mr Roy Baker, expressed his sincere condolences on behalf of himself and the board of WAKO IF and its members all over the world, to his family friends and the entire Kickboxing community in Korea at this sad loss. Out thoughts and prayers are with his family at this sad time.